The story begins with a classic musical travel adventure: an ad in the music section of New York City's Village Voice. In the mid-'90s Elana James was looking to join a "gigging band" when Whit Smith answered her ad. Though he had no shows on the books, Whit somehow convinced Elana to come down to his East Village apartment and rock out for an evening just to see what would happen. When she arrived, he opened the door in big furry slippers and the rest is history. More than a decade later, the Hot Club of Cowtown has grown to be the most globe-trotting, hard-swinging Western Swing trio on the planet. From early days busking for tips in San Diego's Balboa Park, the band has grown and developed into a formidable international sensation. The Hot Club's ever-growing presence on the international festival scene has grown with its relentless touring over the years alongside the release of five critically acclaimed CDs. 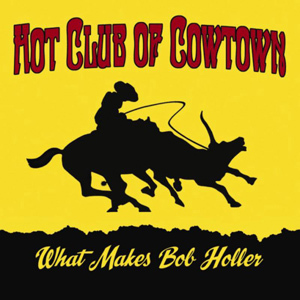 After a two-year hiatus during 2005-2007 the band went its separate ways, reuniting in 2008 with a packed tour schedule and a new studio CD of original material, Wishful Thinking in 2009, followed by the outstanding Bob Wills tribute What Makes Bob Holler in November 2010. In the meantime, some things haven't changed. The band--Elana James on violin and vocals, Whit Smith on guitar and vocals, and Jake Erwin on bass and vocals--still swings harder than ever as it continues to develop it's unique, ever-evolving sound. This journey, which began with the roots of the Hot Jazz era, Americana music, vintage pop and folk music, continues to unfold into the new sound of the group's original songs. In the UK they have appeared extensively on BBC Radio with Bob Harris and Andy Kershaw, and on BBC TV's "Later" with Jools Holland, the "Live From Glastonbury Festival" broadcast, as well as throughout the UK at festivals, theatres, and clubs. Among the youngest members ever to be inducted into the Texas Western Swing Hall of Fame, in 2006 they also toured as musical ambassadors for the US State Department and were honored to be the first American band ever to tour in Azerbaijan. These days, tours with Bob Dylan, Willie Nelson, the Mavericks and others keep the Hot Club of Cowtown busy dazzling new audiences both nationally and internationally throughout much of the year. "I first saw them at SXSW in 1999, continuing the tradition of the great Texan Western bands. Their recent session on ‘Bob Harris Country’ (BBC Radio 2) was a sensation." -Bob Harris, BBC TV and Radio, 2009. "Cynics could say that they play hick-jumping with Jazz sophistication, or Jazz sweetness with hoedown grit. Either way, they scoop off the best parts of both styles, and are a supremely entertaining combo." -Martin Longley, Coventry Telegraph (UK), 2008.